Figure 1. 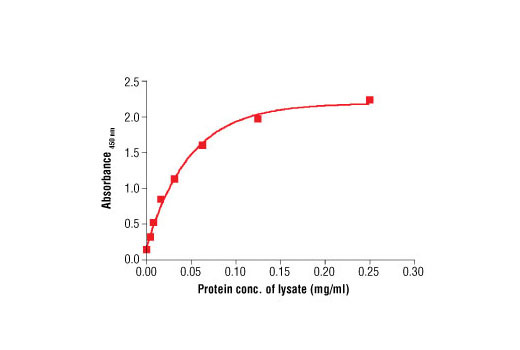 The relationship between the protein concentration of the lysate from HeLa cells and the absorbance at 450 nm using the PathScan® Total β-Actin Sandwich ELISA Antibody Pair is shown. Wash Buffer: 1X PBS/0.05% Tween® 20, (20X PBST #9809). Blocking Buffer: 1X PBS/0.05% Tween® 20, 1% BSA. 1X Cell Lysis Buffer: 10X Cell Lysis Buffer (#9803): To prepare 10 ml of 1X Cell Lysis Buffer, add 1 ml of 10X Cell Lysis Buffer to 9 ml of dH2O, mix. Buffer can be stored at 4°C for short-term use (1–2 weeks). NOTE: Reagents should be made fresh daily. Cells harvested from 50 ml of growth media can be lysed in 2.0 ml of 1X cell lysis buffer plus 1 mM PMSF. Rinse microplate with 200 µl of dH2O, discard liquid. Blot on paper towel to make sure wells are dry. Dilute capture antibody 1:100 in 1X PBS. For a single 96 well plate, add 100 µl of capture antibody stock to 9.9 ml 1X PBS. Mix well and add 100 µl/well. Cover plate and incubate overnight at 4°C (17–20 hr). Wash four times with wash buffer, 200 µl each time per well. For each wash, strike plates on fresh paper towels hard enough to remove the residual solution in each well, but do not allow wells to completely dry at any time. Block plates. Add 150 µl of blocking buffer/well, cover plate, and incubate at 37°C for 2 hr. After blocking, wash plate (Section C, Step 3). Plate is ready to use. Lysates can be used undiluted or diluted in blocking buffer. 100 µl of lysate is added per well. Cover plate and incubate at 37°C for 2 hr. Wash plate (Section C, Step 3). Dilute detection antibody 1:100 in blocking buffer. For a single 96 well plate, add 100 µl of detection antibody Stock to 9.9 ml of blocking buffer. Mix well and add 100 µl/well. Cover plate and incubate at 37°C for 1 hr. Secondary antibody, either streptavidin anti-mouse or anti-rabbit-HRP, is diluted 1:1000 in blocking buffer. For a single 96 well plate, add 10 µl of secondary antibody stock to 9.99 ml of blocking buffer. Mix well and add 100 µl/well. Cover and incubate at 37°C for 30 min. Add 100 µl of TMB substrate per well. Cover and incubate at 37°C for 10 min. Add 100 µl of STOP solution per well. Shake gently for a few seconds. Read plate on a microplate reader at absorbance 450 nm. Visual Determination: Read within 30 min after adding STOP solution. Spectrophotometric Determination: Wipe underside of wells with a lint-free tissue. Read absorbance at 450 nm within 30 min after adding STOP solution. CST's PathScan® Total β-Actin Sandwich ELISA Antibody Pair is offered as an economical alternative to our PathScan® Total β-Actin Sandwich ELISA Kit #7880. Capture and detection antibodies (100X stocks) and an HRP-linked secondary antibody (1000X stock) are supplied. Sufficient reagents are supplied for 4 x 96 well ELISAs. The β-actin rabbit capture antibody is coated in PBS overnight onto a 96 well microplate. After blocking, cell lysate is added followed by pan-actin mouse detection antibody and HRP-linked, anti-mouse IgG antibody. HRP substrate,TMB, is then added for color development. The magnitude of the absorbance for this developed color is proportional to the quantity of β-actin. Capture and detection antibodies are stored at 4°C. HRP-linked secondary reagent is stored at -20°C. For Antibody Pair specificity and sensitivity, please refer to the corresponding PathScan® Sandwich ELISA Kit. Note: This antibody pair detects proteins from the indicated species, as determined through in-house testing, but may also detect homologous proteins from other species. Actin, a ubiquitous eukaryotic protein, is the major component of the cytoskeleton. At least six isoforms are known in mammals. Nonmuscle β- and γ-actin, also known as cytoplasmic actin, are predominantly expressed in nonmuscle cells, controlling cell structure and motility (1). α-cardiac and α-skeletal actin are expressed in striated cardiac and skeletal muscles, respectively; two smooth muscle actins, α- and γ-actin, are found primarily in vascular smooth muscle and enteric smooth muscle, respectively. These actin isoforms regulate the contractile potential of muscle cells (1). Actin exists mainly as a fibrous polymer, F-actin. In response to cytoskeletal reorganizing signals during processes such as cytokinesis, endocytosis, or stress, cofilin promotes fragmentation and depolymerization of F-actin, resulting in an increase in the monomeric globular form, G-actin (2). The ARP2/3 complex stabilizes F-actin fragments and promotes formation of new actin filaments (2). Research studies have shown that actin is hyperphosphorylated in primary breast tumors (3). Cleavage of actin under apoptotic conditions has been observed in vitro and in cardiac and skeletal muscle, as shown in research studies (4-6). Actin cleavage by caspase-3 may accelerate ubiquitin/proteasome-dependent muscle proteolysis (6). Herman, I.M. (1993) Curr Opin Cell Biol 5, 48-55. Condeelis, J. (2001) Trends Cell Biol 11, 288-93. Lim, Y.P. et al. (2004) Clin. Cancer Res. 10, 3980-3987. Kayalar, C. et al. (1996) Proc. Natl. Acad. Sci. USA. 93, 2234-2238. Communal, C. et al. (2002) Proc. Natl. Acad. Sci. USA. 99, 6252-6256. Du, J. et al. (2004) J. Clin. Invest. 113, 115-123.